Castellorizo or Megisti is a small Greek island and municipality in the south eastern Mediterranean, east of Rhodes and about two kilometres off the Turkish coast. The community relies on tourism and fishing to boost the island’s economy. The most striking feature of the island is the brightly painted houses, a tradition dating back to the Byzantine and Turkish time, when the colours of the house would display the status of the family. 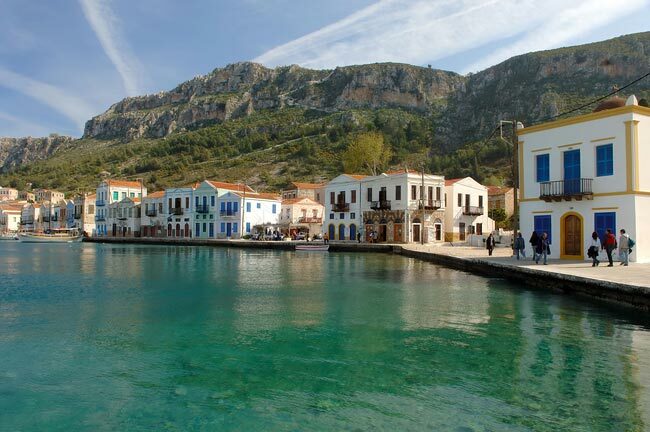 The ancient town of Castellorizo has a beautiful harbour fringed by red roofed houses. The coastline is precipitous and accessible only on the east side of the island at the site of the village of Castellorizo. A red castle on the hill above the harbour, that was built in the early 1300s by Sosicles Nikagoras and occupied by the Knights of St John in 1306, still stands. The Church of St Constantine and St Helene on Castellorizo has two Corinthian granite columns from the Temple of Apollo in Patara. Patara is an ancient Lycian city in Turkey that was captured by Alexander the Great in 333 BC. These columns were brought over from Turkey in 1835. In the early twentieth century the population of the island peaked at about 10,000 people and with a declining economy many residents chose to leave and settle in other countries. A number of families from Castellorizo migrated to Sydney and chose to settle in Randwick City. Many of these families and their descendants remain a part of the Randwick community to this day.